Basel: Indian shuttlers RMV Gurusaidutt, Sourabh Verma and Sameer Verma entered the second round of the Swiss Open World Tour Super 300 tournament after winning their opening round matches on Wednesday. 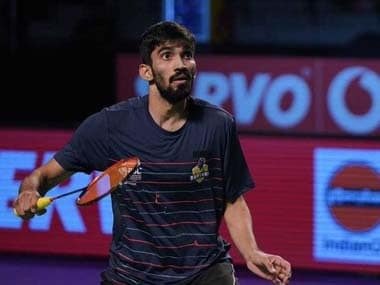 Commonwealth Games bronze medallist Gurusaidutt, who is coming back after recovering from an ankle surgery, defeated Brazil's Ygor Coelho 21-16 21-11. Sourabh then prevailed over Israel's Misha Zilberman 21-11 21-18 while his younger brother Sameer overcame France's Thomas Rouxel 22-20 21-10 in another opening round men's singles match. Sameer will face Japan's Yu Igarashi, while Sourabh and Guru will face off in an all Indian second-round clash. Sai Uttejitha Rao Chukka also eked out a hard-fought 25-23 21-16 win over Germany's Yvonne Li to set up a fight against Japan's Minatsu Mitani. Meanwhile, Abhishek Yelegar lost 14-21 13-21 to England's top seed Rajiv Ouseph while Sri Krishna Priya Kudaravalli, Riya Mukherjee and Vaishnavi Reddy Jakka failed to cross the opening hurdle in women's singles. Lyanny Alessandra Mainaky of Indonesia defeated Sri Krishna 21-11 21-15, Riya fought hard before suffering a 21-13 12-21 17-21 loss to fourth-seeded Russian Evgeniya Kosetskaya and Vaishnavi went down 19-21 17-21 to Julie Dawall Jakobsen of Denmark.